To be effective, the conditioning system on a mower-conditioner must be properly adjusted to ensure rapid drying of forage in the field. Rapid drying maintains the quality of the forage and reduces the risk of windrow losses and crop damage due to precipitation. Two types of conditioning systems used on mower-conditioners are roll and impeller. The primary adjustments for the conditioning rolls are roll spacing, roll pressure and timing. For the impeller type conditioner, the position of a deflection shield above the impeller determines the degree of crop conditioning. As crop conditions change, adjustment must be made to continue to maintain the effectiveness of the conditioning. The conditioning roll clearance and pressure must be adjusted to ensure the stems are cracked which increases the drying rate of the stems. Since the stems dry slower than the leaves, the stem cracking is the important indicator of proper conditioning. At least ninety percent of the stems should be cracked. Another method of checking roll adjustment is to measure the clearance, which should be between 1/16 and 3/32 inch. When the crop is high yielding and has thick stems, the 3/32 inch adjustment would be most appropriate. For low yield cuttings and fine stems, the 1/16 should be considered. See the procedure developed by K. J. Shinners at the end of this article for one method of determining the roll spacing, especially for corrugated rolls. The machine operator must be mindful of the forward speed that also impacts the thickness of the forage mat passing through the roll conditioner. Forage mat thickness is less at slower forward speeds. Machine operators should also check the operator’s manual for proper adjustment of the conditioning rolls. In one case, the manufacturer recommends adjusting the clearance with the machine operating at slow PTO speed while tractor and machine are stationary. They suggest reducing the roll clearance until vibration and/or noise occur and then increasing the roll spacing to a specified point beyond where vibration and/or noise are eliminated. Most machines will have an adjustment at each end of the rolls. The roll pressure also needs to be sufficient to crack the stems. For high yielding crops, creating a thicker mat of forage moving through the rolls, higher pressures are required. Excessive pressure can cause undesirable leaf loss. Spring tension is adjusted to change roll pressure. On impeller conditioning systems, the conditioning is due the rubbing or abrasion caused by the impeller fingers. Most of these machines have an adjustable deflector above the impeller which influences the degree of contact between the forage and impeller. When adjusting the deflector down, the degree of forage conditioning will increase. Nearly all the harvested stems should exhibit some mechanical abrasion caused by the impeller blades. These mower-conditioner adjustments will reduce the risk of poor quality forage. Any steps that reduce the drying time are very important to harvesting high quality forages in Wisconsin weather conditions. Following is from: Shinners, K. J. 2002 Getting the Most from a Mower-Conditioner. Presented at the 2002 Wisconsin Forage Symposium. This procedure can be used to determine the roll clearance on most roll type mower-conditioners. The owner’s manual of most mower-conditioners will have the proper clearance and the correct procedure for making this adjustment. Generally, the roll clearance should be in the range of 0.060 (1/16) to 0.090 (3/32) inches. If the clearance is less than this range, excess leaf loss and roll wear can occur. If the clearance is significantly more than this range, then the crop will not be conditioned as effectively and slower drying rates can be expected. 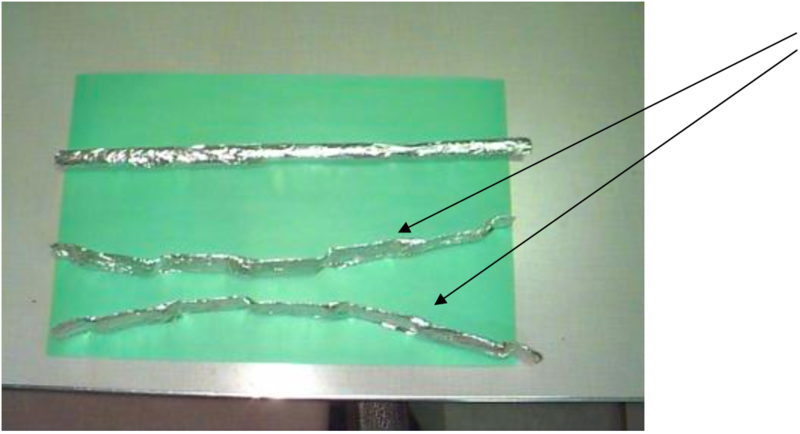 Cut three (3) pieces of typical household aluminum foil 18 inches in length. The foil strips should be at least 12 inches wide. Using each strip individually, form three (3) separate rolls by wrapping a foil strip around a mandrel of rod, pipe or dowel that is 0.375 (3/8) inches in diameter. Slide the roll off the mandrel taking care not to crush the foil roll. Place one foil roll in the approximate center of the conditioning rolls and the remaining two foil rolls about 1 foot from each end of the conditioning rolls. 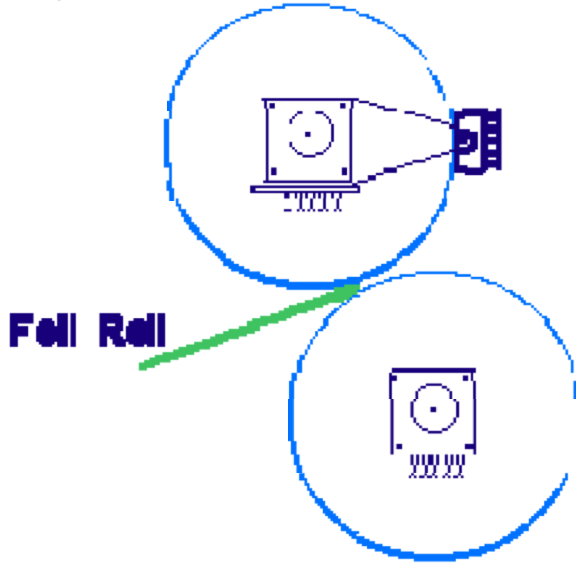 The foils should be placed perpendicular to the roll’s longitudinal axis (see below). Make sure the cutting platform is fully lowered. This is the only safe way to make this measurement, plus on some mower-conditioners, raising the platform also opens and separates the rolls, preventing an accurate measure of the minimum roll clearance. Turn the rolls over by hand until the foil rolls come completely through the rolls. The rolls will crush the foil rolls and the minimum roll clearance can be determined by using a digital or dial caliper to measure the thickness of the foil roll. A low-cost digital caliper (~$40) can be found at Techni-Tool (Part No. 575GA103, 1-800-832-4866). Take several measurements of the thickness along the length of each foil roll and determine an overall average. The measurement should be taken where the “crimp” or smallest clearance occurs as noted in the above figure.